Hey hey! If you follow me on Instagram (@tenjuneblog), you know that I had another eventful week last week. On the heels of my grandfather passing away unexpectedly two weeks ago, HDawg got scary sick last week and had some terrible wheezing/breathing problems. Two trips to the emergency care center later, he is doing much better, THANK goodness! Just in time for my parents to watch him and Little Lady June on Saturday while David and I went out and celebrated our six year wedding anniversary. Love that man. If you haven't ever seen our wedding pictures, I shared some here and here. Needless to say, it's been crazy crazy as always. Even still, I am so grateful to have healthy babies and a special anniversary to share with my man! Now, onto some good interior design. It's been awhile, but I think it's high time that I bring back my "Look for Less" series, don't you think? For those of you who are new round these parts, the low down on my Look for Less series is that I choose a super fab image from one of my favorite interior design publications and recreate it for you guys on the cheap. I'll shop products and create a whole source list so that you can make the room on your own with less expensive items. Creating high end design on a dime, if you will. Today I'm taking this ah-maz-ing-ly beautiful eclectic glam home office space found in the 2013 holiday issue of Domino magazine. There are just so many things I love about this Manhattan apartment office, I had to find a way to recreate it in a less expensive way. So, here ya go! Let's start with the rug and work ourselves clockwise around the design board. I found this awesome Moroccan rug on Rugs USA's website. A 5x7 is $503 but right now they've got a 55% off sale (coupon code: MDS55) which makes the whole thing less than $250. That's awesome for a big rug. The modern chair pictured is a knock off version from Overstock. It's actually real leather and rings in at a cheap $150. I've seen a basic two-drawer metal file cabinet like the one pictured at just about every thrift store I've ever been in. You could also easily find one on Craigslist, I'll bet for someting like $20. Give the cabinet a coat of flat black spray paint and you're set. One of the best features of the Domino office is that insane memo board. I can't quite tell from the photograph what this board is made out of, but it looks like it may be linen. You can recreate by simply covering cork squares with linen (like this fabric from Jo-Ann). Simply attach the fabric to the cork with fabric glue, hot glue or adhesive spray glue like I used in my DIY linen memo board. You should be able to purchase enough yardage and other materials to make a huge statement piece like this for less than $100. Not bad considering the impact this has on the room! I'm such a big fan of beautiful, natural wooden pieces and the console table featured in the Domino office is no exception. 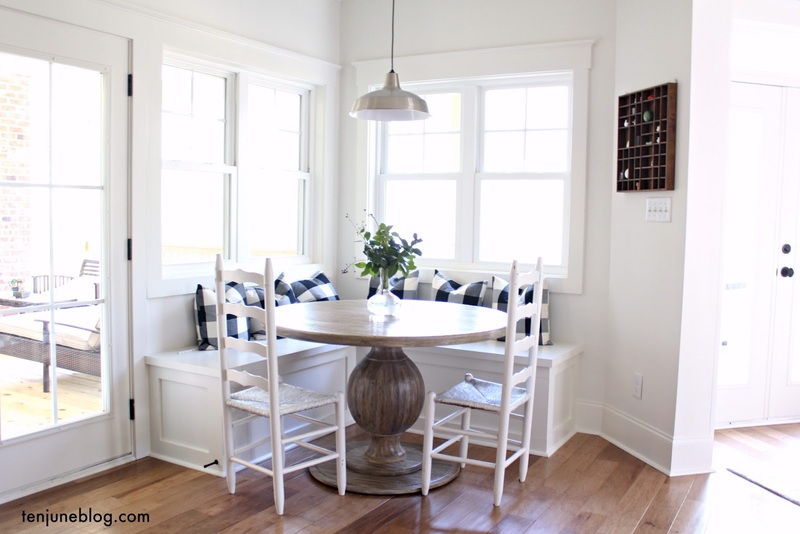 I have a few pieces of wooden furniture from World Market (like our living room side tables and dining room table) and have always been impressed by their quality and price points. I love this World Market wooden console table for the office space. By the way, WM has free shipping over $150 (coupon code: WMFS1502) and a ton of their outdoor stuff on sale right now! Last, but not least, is my favorite part of my design board. Friends, let's make our own gold + glass desk for LESS THAN $60. Whaddya say? Here's what you need: Ikea and spray paint. The perfect combo! I have been eyeing these Ikea trestle legs for awhile but just haven't come up with the perfect project to use them on... yet! But they'd be perfect for this room. Spray paint them with some shiny gold paint and top with this glass desktop piece. Boom, you've got yourself a cheapie but fabulous looking desk. 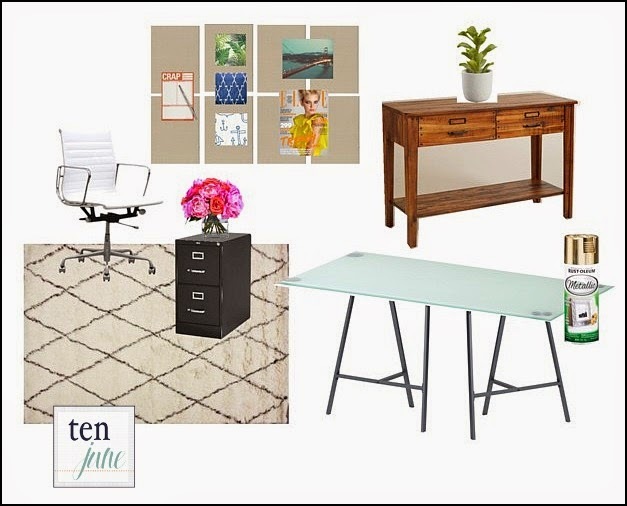 So there you have it, an eclectic glam home office look for less. I've actually got home offices on the brain right now for a good reason... I'm currently making some updates to our home office in the form of some much needed organizational help. I can't wait to share with you later this week! Check out some of my other Look for Less design boards + source lists. Psst! Don't forget to submit your Tuesdays at Ten June posts for tomorrow! love it! the desk is my favorite! i am looking for an amazing desk for our living room and may need those legs!